Emboldened by Trump’s continuing threats to protect al-Qaeda in Syria, Israel has chosen the joyous occasion of the Damascus 60th International Fair…to bomb Damascus International Airport. Not that it matters to Israel — or to Trump — it is a war crime to bomb civilian planes and airports. Several missiles were intercepted by Syria’s air defense system and no casualties have been reported at this writing. As with its 4 September bombings, Israel may have again attempted to test the Syrian air defenses for recently acquired S300 systems for the anticipated Three Musketeers plus Germany’s coming aggressions against Syria, to protect their Al-Qaeda terrorists in Idlib — the most perverse generation of Al-Qaeda, whose White Helmets faction have kidnapped dozens of Syrian children and have their canisters of weapons-grade chlorine ready. 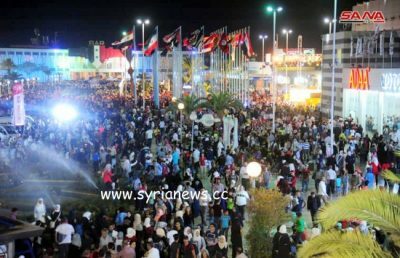 Israel chose this time in an impotent attempt to destroy the joyous occasion of the final day of the very successful edition of the Damascus International Fair. One-half million persons attended the exposition, whose exhibits included such miracles as the SAHAB 73 airplane. The airport is just kilometers away from the fair grounds; surely Israel was disappointed in its criminal missiles being intercepted, but also that the people at the fair did not panic, did not flinch; they continued their visit. These are the resilient people of Syria who have stood up to the US and UK invaders of Iraq, who are surrounded by NATO and NATO stooges. These are Syrians who have fought and won a massively armed al-Qaeda and all of its derivative sects. They are on the verge of getting their country back on its feet once Syria finishes off al-Qaeda’s last stronghold, in Idlib. These people should not be tested; whoever challenges them will end up losing and losing dearly.